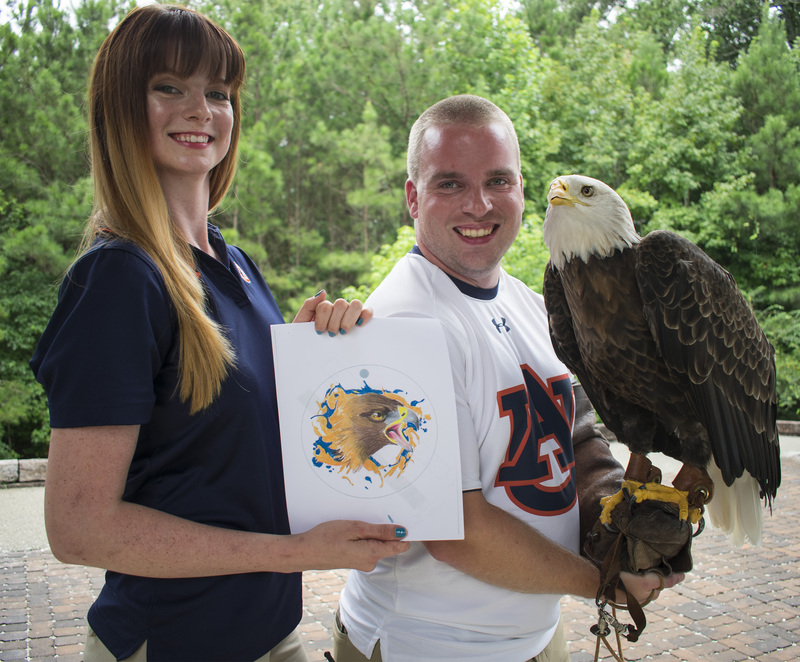 Doctoral student Robyn Miller, left, with Raptor Specialist Andrew Hopkins and Spirit displaying one of the eagle lure designs that will be part of the lure and jess sets auctioned during AU’s 2017 Football Season. Doctoral student Robyn Miller wears many hats — by day she is a doctoral student earning her degree in English and teaching classes at Auburn University. Part-time, she volunteers at the Southeastern Raptor Center (SRC) where she works with the eagles and other raptors. At other times, she is an artist who is sharing her love for the raptors and designing the game day lures and jesses used during the pre-game eagle flight in Jordan-Hare Stadium. Miller is one of several volunteers helping the SRC design the eagle lures and jesses that will once again be auctioned to Auburn football fans this season. The SRC’s annual online auction will begin with Auburn’s first football game on Sept. 2. The auction will open on Thursday, Aug. 31 and close on Monday, Sept, 4, says Andrew Hopkins, a raptor specialist at the SRC and one of the trainers for the Auburn eagles. Each lure and jess is handmade of leather and is unique to the specific game. A Kennesaw, Ga., native Miller has volunteered at the SRC for five years. “Every year, I help to design the eagle lures and I see my work as a way to give back to Auburn by doing something that I really enjoy. “I have always been interested in education and conservation, and in the rehabilitation of raptors,” Miller adds. This lure and jess set is for the Sept. 2 pre-game flight of the Auburn eagle. Jesses are cuffs worn around the eagle’s ankles with straps to assist the handler in securely holding the eagle. The lure is used by the handler to entice the eagle to land midfield and often has talon marks from being used. 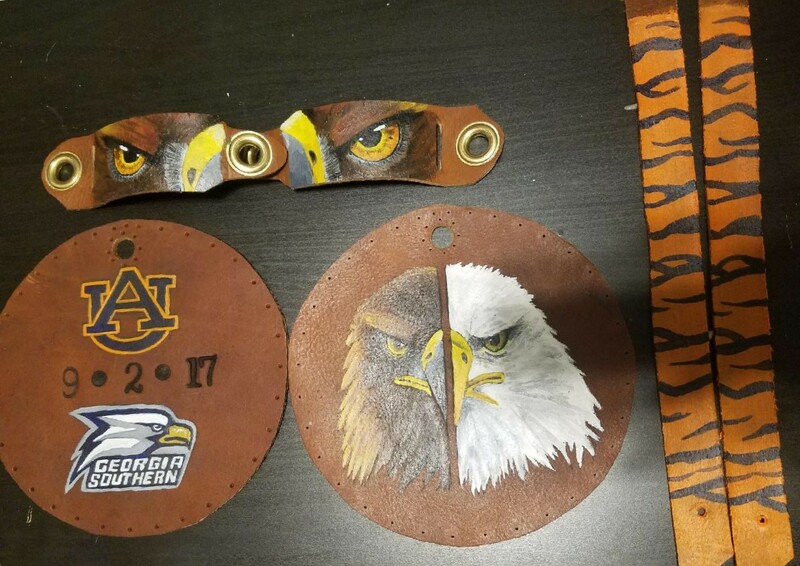 The items are handmade and uniquely decorated by volunteers or staff of the Southeastern Raptor Center and are used one time – during the Auburn eagle’s pre-game flight. The online lure and jesses auction is on the SRC website, and fans can check out photographs of the lures and jesses, and place bids. Each auction will open at the same time – 2:30 p.m. on Thursdays prior to the home game and close on Monday after the game at 2:30 p.m. Money raised from the auctions support the center’s mission of rehabilitation, education, and conservation.